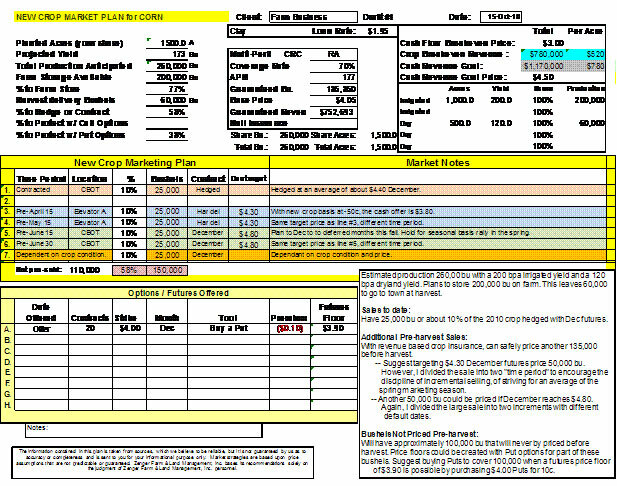 Grain Marketing Plans from Zenger Management, Inc.
Supply, Demand, and Risk . . . Identifying the "Selling Season"
Many unpredictable forces influence the grain market. Yet, there are repeatable price patterns that the market follows in most years. These "seasonal" patterns are a function of supply, demand, and risk. Grain prices are usually lower in the harvest season when supplies are both known and abundant. Prices are higher during the planting season when supplies are low and in tighter hands, and when there is uncertainty about the next crop. The normal "selling season" for each crop can be identified by reviewing historical price action. This "selling season" is the foundation of the marketing plan. The pre-harvest sales are divided into four to six "increments". The anticipated market, type of contract, and delivery time are identified for each increment. Preliminary target prices and default dates are assigned to each pre-harvest increment. Developing the marketing plan during the winter when there is time to plan and when emotions are calmer is important. The plan will usually be executed during the growing season when farmers are busy and markets are active. It is easier to take action if "how much", "to who", "for delivery when" and "with what tool" have already been identified. Yet, plans should not be set in concrete—things change from winter to spring. A good plan is flexible; it can be tweaked as circumstances change. Farm profits are increased by "merchandizing" grain. Pricing grain involves two decisions . . . "when" and "how". The "when" to price is determined by profitability, seasonal charts, technical indicators, and cash flow needs. The "how" grain is priced can increase profitability. Farmers who merchandize grain, who maximize "carry" and sell strong basis, increase profits and gain a competitive advantage. Studying past sales with the objective of learning is wise . . . stewing about what could have been is not. Stewing is a waste of mental energy that steals opportunities. A sale based on an informed decision that considered the seasonal history, profit margin, cash flow need, cost of storage, and unpredictability of the market is a good sale. Greed says to stew when prices rise later . . . wisdom says to devote mental resources to other endeavors—to something that promises a good return.